Shared Services and BPO Cebu Summit: How can Cebu's SSCs and BPOs remain competitive? Cebu has been ranked a premium destination for shared services and business process outsourcing, emerging #8 on the Top 100 Outsourcing Destinations for 2014 list by Tholons. But like any new and exciting destination it won’t stay under the radar for long! If you want to learn more about how you can take the next big step for your shared services strategy and help your company achieve its strategic objectives then I invite you to join me at the Shared Services & BPO Cebu summit, 10 – 11 February 2015, Cebu City Marriott Hotel, Philippines. The event features a stellar speaker line-up and will demonstrate how you can maintain a competitive edge through innovative talent management, value added services and robust cost cutting strategies. PLUS! as a reader of The Tribune Post, you can enjoy 10% off of the conference ticket. You can register online, by emailing enquiry@iqpc.com.sg or by calling +65 6722 9388. How can Cebu's SSCs and BPOs remain competitive? Cebu is rising as a premium destination for Shared Services and BPOs and it is now all the more important for you to re-examine how you will maintain your competitive edge. Full-time employment in the outsourcing sector of Philippines has gone up by 11%, having crossed the one million mark and growth of BPO business by 2016 is forecasted at US$25 billion. To differentiate yourself from the competition and stay on top of your game, I’d like to invite you to join us at Shared Services and BPO Cebu, the only event for shared services and outsourcing in Cebu between 10th – 11th February 2015 as we discuss key strategies such as benchmarking, customer centricity, talent management and retention, data analytics and more. PLUS! Register by Friday 12th December 2014 to save up to USD$600 on the ticket price! We all know the Philippines is booming! The BPO and contact center sectors alone are looking to grow from 900,000 workers to 1.3 million by 2016, but what does this mean for your leadership & talent transformation strategies? Developing a strong team of future leaders has never been more important than now. The 2nd annual Leadership & Talent Transformation Summit will give you the opportunity to hear best practice case studies, discuss reliable and proven strategies for leadership development and initiate crucial changes for the coming year. Building a pipeline of future leaders to anticipate business demands is just one of the topics being covered at this year’s event. We will also discuss cross cultural talent transformation, utilizing technology to reduce training costs and rapidly progressing the careers of a young workforce. Linda L Rosales, Country Human Resources Director, DHL Supply Chain Philippines Inc.
All Tribune Post members are eligible for a 10% discount to attend the event. Please use the discount code ISG_Tribune when registering (http://goo.gl/5Hm2DY). I hope you can join us this March where together we can face these challenges head on, benchmark from one another and create more robust means to manage our talent. A common question every time an applicant is in a job interview is "What will make you stay in the company?." This question is usual especially if there is a high rate of attrition and the company is struggling to get the right fit for the available important job especially if there will be a vital task under the position like as Team Leads, Managers or Directors where the positions are handling a vast manpower or decision making that will make an impact to the organization. Here are the 5 answers based on the study I conducted. This is the compensation and fixed amount of money for the employee or compensation paid to an employee by an employer in return for work performed. Salary is commonly paid in fixed intervals, for example, monthly payments of one-twelfth of the annual salary. We are not only talking about the facility here but the overall fit to the team members with positive vibes that makes the employees coming to work every single day and this also provides motivation and can also boost morale. Aside from the job scope itself, one factor that significantly influences how employees feel about work is the environment. By work environment, It is everything that forms part of employees’ involvement with the work itself, such as the relationship with co-workers and supervisors, organizational culture and room for personal development. These are the extra more like compensation other than the salary but usually in a form of packages. Heading the list of must-have benefits is medical insurance, but many job applicants also demand a retirement plan and disability insurance. Some companies can provide bonuses also intact in the contract between the employee and employer to differentiate the company from the rest. These are the people you work with at your job and usually those you constantly have transactions in a daily basis. The relationships with your colleagues are important. Good workplace relationships can help more to do the job better. They can make going to work everyday enjoyable. Bad relationships with colleagues can distract you and can turn your job into a nightmare. These resources will help you have good relationships with your colleagues. These are usually the immediate supervisors where employees report to. They are in charge in the decision making of one department or the whole organization. A lot of employees especially millennials according to different reports likes to work with leaders not managers who can share, empower and lead the team. It’s not easy being a leader these days. You’re responsible for recruiting, hiring, training, coaching, modeling, engaging, monitoring, motivating, anticipating, prioritizing, planning, evaluating, clarifying, adapting, envisioning, directing, disciplining, reinforcing, reporting, recognizing, budgeting, and building alliances. And that’s all before lunch. And if you struggle with just one, your reports will say you’re over your head. Employees included the "Boss" as one vital part for them to stay in the organization. Usually, the immediate head. Though it's a two way process, employees must also be professional in dealing with the bosses in the workplace and vise versa meaning with respect, reliability and skills in producing an output for the task given. We’ve recently sent you exclusive call center content researched and produced from the Call Center Philippines team. I do hope you had a chance to enjoy the articles. For more in-depth information in this area, I invite you to join me at Call Center Week Philippines 2014, taking place 2 – 4 December 2014 in Manila. Led by top industry experts, the event will show you how to drive change through robust talent management, improved customer services and value adding call center services. Embracing the future of call centers with topics ranging from social media integration, to harnessing global data via data analytics, dashboards, and digital signage. AND, as a reader of the Tribune Post, you are entitled to a 10% discount off the event registration price. Just quote the discount code "CCPH_TP" when registering. You can register online or you can call us on +65 6722 9388 or email enquiry@iqpc.com.sg. 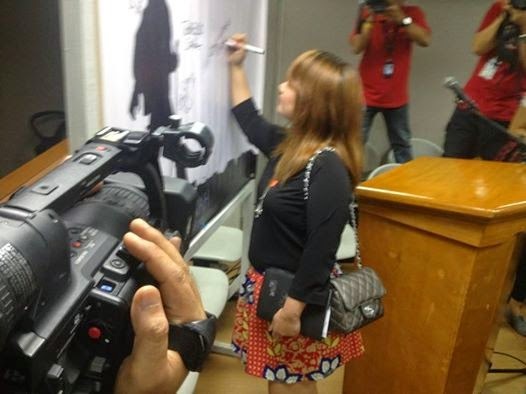 October 12, 2014 Manila Philippines – DZME, home of the top caliber national broadcasters of today in the Philippines is set to glare all the radio listeners starting October 18 as it re launches its much awaited radio show that tackles about the latest trend on career planning, recruitment, job opportunities and professional advancement anchored by no other than Engr.Grace Bondad Nicolas with Mr. Rod Magaru. Entitled “Lets Talk About Career”, the radio show will discuss about career opportunities in general including the latest trends on finding the opportunities available left and right. The show will also include discussion on tips on how to win those powerful interviews, dressing up on the occasion and preparing to knock the panel discussion. The show will also discuss social media, lifestyle and events that all Filipinos specially job seekers will benefit. The show will also invite respectable and successful individuals who possess winning credentials in the marketplace including top elite professionals and personalities who followed their vision and learned key competencies while climbing the ladder of success. Engr. Grace Bondad Nicolas is an entrepreneur, marketing professional and project manager for 11 years from different industries; Construction, Tourism, Online Gaming and Telecommunication who manages to send her advocacy across using different platforms as the columnist to 4 local newspapers that tackles things about careers in Business Process Outsourcing, Call Center, Network Planning and Optimization, Tourism and Lifestyle. 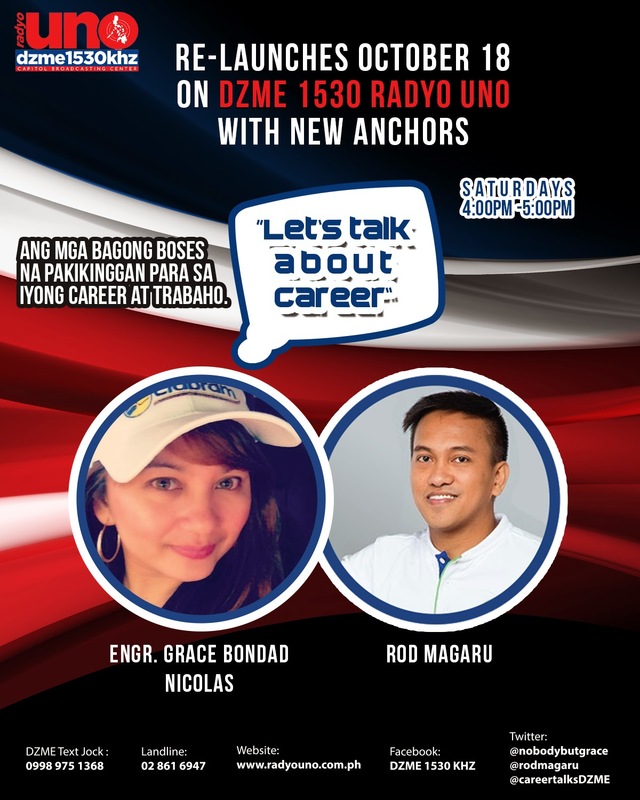 She also have a segment twice a month under Youth Power Radio at DZME 1530 Radyo Uno entitled “Social Grace” with discussion about earning from digital marketing. She is also a public speaker and currently working as the marketing & branding head under the umbrella of Elabram Systems Group which is based in Malaysia with offices in Indonesia, Thailand and Philippines. Mr. Rod Magaru is a successful finance professional that trains key finance people from various country offices in an organization. He is also the famous celebrity blogger that blogs and writes about lifestyle and entertainment. He is also a Social Media Manager and Brand Ambassador to different multinational companies promoting various campaigns of international and local brands. Both of them are successful in their respective profession and both top bloggers in their niches. The tandem will surely ignite the job seekers in rethinking their ways of preparation for job hunting and finding the career path that suits them. Leaders are made not born. One can learn from the wisdom coming from the parents, whether you like it or not, what we learned from them are the basis of our decisions, actions and even by answering difficult problems in life. Our parents molded us, they are the pillars of who we are today. One can gain the characteristics by the experience we have at work or environment, by attending different leadership seminars or just by reading a book. One just needs to have the right mindset and skill to grasp what it takes to be one. "Effective leaders are made, not born, Powell said. They learn from trial and error, and from experience. When something fails, a true leader learns from the experience and puts it behind him. "You don't get reruns in life," he said. "Don't worry about what happened in the past." "You know you're a good leader when people follow you out of curiosity." Being able to influence, direct and motivate others. Persevering when things are not working out. Taking a positive attitude to frustration/failure. Being flexible: prepared to adapt goals in the light of changing situations. There are so many books about leadership. If you think you can influence one, try to influence more and there is a measurement to that and it’s called success in most negotiations. Being able to convince others is one characteristic of a leader, it means that you are credible, trustworthy, persevere and can motivate others in their decisions. Perceive yourself as a leader first before others view you as one. If you don't have a confidence, try one step at the time to gain it. Stand up and do something that others are afraid to try. Use initiative to act on opportunities. Become a leader before other people view you as one. If you are an employee, the boss can see you and can reward those who take the lead. Take responsibility for own objectives: set priorities and targets. Display a "can do" attitude even in demanding situations.. Try to solve problems, rather than to pass them on to other people. First answer is ‘yes, I’ll make it happen’. "Go the extra mile" when asked to do tasks. Go beyond your job description. Do work that gets you noticed. Don’t limit yourself. Be the brightest and reddish apple in the basket. Show enthusiasm: this will be noticed and you will eventually be rewarded. Take ownership of problems: anticipate potential problems, take pre-emptive action and act quickly to resolve problems. Introduce improvements to the way things are done. Develop innovative practices. Value innovative thinking. Learn new skills that will enhance capability. Common sense is not common! Reading the content above gives you a glimpse and guidance to become a leader. One just needs to become confident but needs also to have the tools to back up the decisions and suggestions. A leader can detect another leaders and as what others say, we all wants to be in a company of leaders who can teach us more and lift us more for more success in life. Nobody likes a failure. To motivate and retain call center staff, managers have been experimenting with “fun” recreation & welfare initiatives like performance based competitions and company activities, however employee attrition remains worryingly high. Call center staff are notably transactional, but are financial incentives the ideal way to retain and motivate them? This complimentary article was researched and produced as part of the research process for Call Center Week Philippines, taking place in Manila 2 - 5 December 2014. The forum will bring together call center leaders from Transcom, Acquire, Jetstar, DHL and Ebay among others to network and discuss specific challenges they are tackling in talent management, improving customer satisfaction and value adding call center services. And if you have any questions regarding the article or the conference, please contact me on the details below. P.S. The #1 rated speaker from Call Center Week in US will be flying in to Philippines to give a half day masterclass on boosting customer and employee experience. Don’t miss it! P.P.S. Readers of Tribune Post are entitled to a 10% discount on the event price. Just quote the discount code CCPH_TP10 when registering. Email enquiry@iqpc.com.sg now.